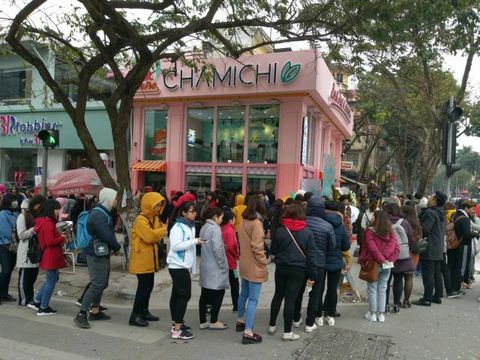 Customers queue up to purchase milk tea outside a shop in Ha Noi. Market researchers have found the market is growing at 20 per cent a year and reached US$300 million two years ago. There are over 100 brands already and many more famous names are flocking in. In large cities like HCM City and Ha Noi, it is easy to find bubble tea stores belonging to major brands like Alley, Gongcha, Phuc Long, Ten Ren, and Royaltea. There are also smaller stores with cheaper prices run by small business people. Seeing the demand, many coffee chains like Highlands and The Coffee House and restaurants have added bubble tea to their menu. Besides bubble tea simply being a popular drink for various age groups, the shops selling it have become a haunt for youngsters because of their facilities and decor. A spokesperson for a famous brand name, Gong Cha, said: “Competition in bubble tea market in Viet Nam is a marathon. Brand expert Vo Van Quang was quoted as saying by Nguoi Lao Dong (The Labourer) newspaper that the popular drink in Hong Kong and Taiwan has undergone many changes in the Vietnamese market with many toppings to match Vietnamese tastes. Most of the milk tea brands have come to Viet Nam as franchises, he said. A bubble tea shop is much cheaper to set up than a coffee shop while the profits are huge, he said. Dr Dao Duy Khuong, a retail expert, said milk tea, unlike coffee and tea, targets youths in big cities, and this demographic’s consumption behaviour is trendy meaning investors should change their offerings frequently.